Can “sticky” isotopes help us measure how water flows deep in the ocean? The ocean’s circulation is thought to play an important role in our climate by transporting heat from tropical regions toward Earth’s poles. Of particular interest is the circulation in the Atlantic Ocean, where warm, shallow waters from the tropics flow northward and release heat in the North Atlantic region. There, the waters become colder and denser; they sink to the abyss and flow back southward in deeper parts of the oceans. To understand how our climate operates then, we need a deeper understanding of how our oceans operate. In particular, we need a deeper understanding of the abyss (roughly below the top 1,000 meters or 3,280 feet), which represents 70 to 80 percent of the ocean’s volume. But the difficulty, time, and expense of collecting measurements in the depths leave us with a severe scarcity of data. Despite considerable progress over the last decades, we still have an incomplete and somewhat fuzzy picture of the motion of waters in the abyss. However, two naturally occurring radioisotopes in the sea—like breadcrumbs in Hansel and Gretel’s forest—may offer us another means to track circulation in the deep. In the oceans’ upper portions, physical oceanographers can calculate the direction and speed of moving water by using measurements of temperature and salinity, current meters, floats, and other methods. In the abyss, however, variations in temperature and salinity are generally smaller, and current meters and floats are often compromised by the influence of swirling water, or eddies. Another means to track ocean circulation is by tracing the pathways of chemical compounds that become embedded in distinct water masses that move about the ocean. Such tracers include, for example, dissolved oxygen; biological nutrients (nitrate, phosphate, silicate); radioactive tracers (such as radiocarbon or tritium); and industrial compounds (such the chlorofluorocarbons, or CFCs). To this palette of ocean tracers, we can add more exotic ones, such as thorium-230 (230Th) and protactinium-231 (231Pa). Both tracers have properties that other tracers lack and therefore can provide complementary information. 230Th and 231Pa have half-lives of about 76,000 and 32,000 years, respectively. Both are produced by the radioactive decay of naturally occurring uranium isotopes. Because the uranium isotopes are distributed approximately uniformly throughout the oceans, so are the rates at which 230Th and 231Pa are produced. Moreover, it would take hundreds of thousands of years to change the concentration of the uranium isotopes in the ocean by an appreciable amount, implying that 230Th and 231Pa production rates also do not change much over time. In the 1980s, marine geochemists such as Michael Bacon and Robert Anderson, then both at Woods Hole Oceanographic Institution (WHOI), and Yoshiyuki Nozaki of the University of Tokyo developed a simple theory: If no factors other than production by uranium decay and particle scavenging came into play, concentrations of 230Th and 231Pa should increase continuously as you go deeper in the ocean. This implies that another factor is at work: The ocean’s circulation, which is disregarded in the theory, may be influencing what would otherwise be a steady increase of 230Th concentration to the bottom. If so, could we use 230Th to detect circulation in the deep? Using 230Th to infer information about ocean circulation is a daunting problem: 230Th measurements are scarce and sometimes imprecise or inaccurate, and our understanding of how 230Th is scavenged and transported in the ocean is still incomplete. This is what is known in mathematics as an “underdetermined” problem—one in which you have more unknowns than equations. Many people perceive that underdetermined problems cannot be solved, but that is not true. Among the techniques to solve underdetermined problems are so-called inverse methods. Such methods can combine imperfect data and an imperfect model to extract information not obtainable using each separately. Moreover, they can provide an estimate of how reliable the solution is, given the uncertainties of the data and the model. Our approach was to use an inverse method to combine, first, physical oceanographic data (measurements of temperature and salinity, and estimates of water flow at specific locations from current meter data) with a model of the abyssal circulation in the North Atlantic. Second, we included the existing measurements of 230Th in the ocean and a model that describes how 230Th is produced, scavenged, and transported by ocean circulation. By comparing the circulations estimated with and without 230Th, we found that the 230Th data indicate a more vigorous southward flow of water beneath 1,000 meters in the North Atlantic. The physical oceanographic data alone did not indicate such a strong flow, because the temperature and salinity data we used show small horizontal variations in the North Atlantic (compared to their uncertainties). In other words, these data can be accommodated by a relatively sluggish flow. In contrast, the 230Th measurements at depth show larger variations that can be explained by a strong southward flow. Thus, 230Th data have provided information about the abyssal circulation that complements the physical oceanographic data. We are just beginning to explore how useful 230Th and 231Pa can be to tell us about ocean circulation. 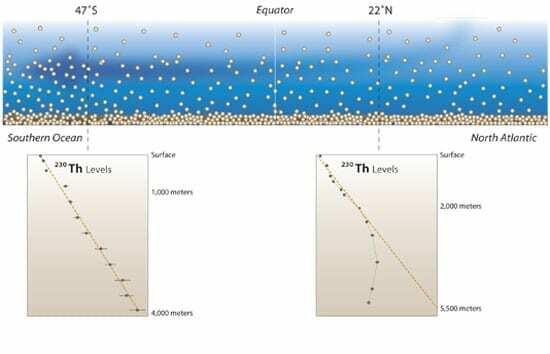 An emerging international program called GEOTRACES, designed to investigate how various trace elements and isotopes are distributed in the world’s oceans, should give us more much needed measurements of both tracers in seawater. We also need to learn more about these tracers’ behavior. Laboratory experiments, for example, show that Th and Pa may stick at different rates to different types of particles in seawater. 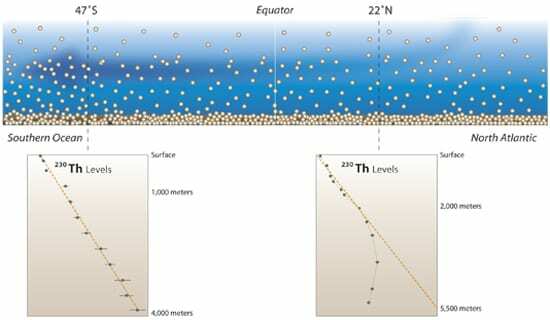 To interpret the measurements of 230Th and 231Pa in the ocean, we need to better understand how the abundance and the chemical composition of the particles affect the scavenging of both tracers from seawater, and hence their distribution. Data for the abyss are so scarce, yet the circulation of the deep ocean is so important. We must explore any avenue that may help us measure it. This research was supported by the WHOI Ocean and Climate Change Institute and the National Science Foundation. It involved the essential collaboration of Roger François (formerly at WHOI, now at the University of British Columbia) and Jan Scholten (at the Marine Environment Laboratory in Monaco), who are experts in 230Th and 231Pa measurements in the ocean. It also benefited from Ruth Curry at WHOI, who provided access to the HydroBase2 compilation of ocean temperature and salinity measurements.